Breeding Irish Sport Horses, from the past, through the present and for the future ! Below is a selection of stallions which are to be found in the pedigree of the broodmares and the younger bloodstock bred on the farm, past and present. View our 'For Sale' page 'here'. 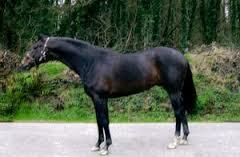 Sire : Errigal. Dam by True Boy. This stallion needs no introduction as he is to be found in most Irish pedigrees and is the sire and dam sire of world class performers, too numerous to mention. Very successful sire of sires : Diamond Lad, Laughton's Flight, Errigal Flight, Flagmount King, Flagmount Diamond, Diamond Serpent, King's Servant etc. Sire : King Of Diamonds. Dam : Kildalton Countess by Ben Purple. Sire : King of Diamonds Dam : Highlight II by Highland Flight. Successful sire of international showjumping and event horses. Sire of International performer, Ardnehue Flight, and is also sire of leading 2012 Gran Prix performer, Mrs Quinn. Sire : Sky Gypsy. Dam by Abernant by Owen Tudor. Very successful sire of showjumpers and event horses. 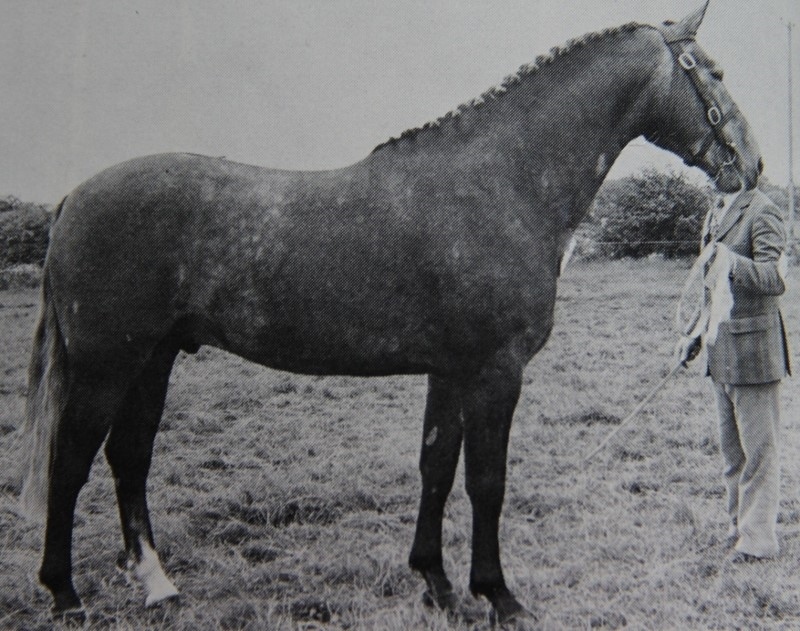 Abernant (TB) can be found in many warmblood pedigrees. Click on photo to view video from 1950. Sire : Nearco. Dam : Blandford X The Tetrarch breeding. 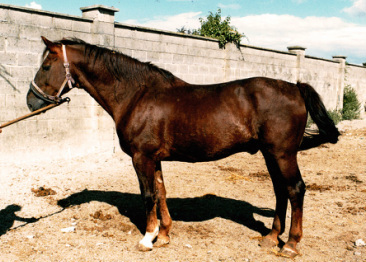 Irish bred TB stallion. Prepotent sire of sires of successful sport horses. Sire of Cruising's grand-sire, Nordlys (TB) and Coevers (TB) among others. Epsom Derby and 2000 Guineas winner. Champion Sire and Champion Broodmare Sire. Sire of sires such as First Consul, Carnival Night, Rasputin, Carlburg etc., all great progenators of showjumping and eventing horses. 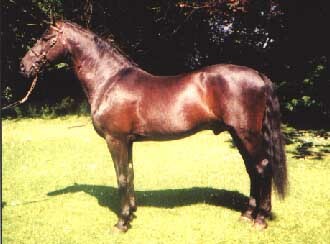 Sire : Cor De La Bryere Dam by Liguster. Proven sire of top class International show jumping and event horses. Sire : King Of Diamonds. Dam by New Chieften. Click on photo for video of RDS win. Sire : Clover Hill. (RID) Dam sire : Light Brigade (TB). Winner of many National and International Grand Prix. Showjumping and event sire. Four star stallion for showjumping progeny and Five star stallion for eventing progeny. Consistent sire of many top level national performance horses incl winners at Millstreet and RDS Dublin Horse Show. Sire : Dancing Brave. Dam sire : Shirley Heights. Classic thoroughbred pedigree. Sire of numerous show champions and event horses. Four star stallion for eventing progeny. Sire : Moyglare Samson. Dam by Abbeyleix Owen. Connemara pony stallion. Prolific sire of event horses. Sire : Libero H by Landgraf. Dam : Jolanda. Dam sire : Lord Calando X Ahorn. Ranked no. 11th in the world as sire of showjumpers. Leading sire of mares to have successfully completed the KWPN performance tests in 2010. Awarded 'Preferent' status by KWPN Studbook 2011. In 2013, Numero Uno had an unprecedented number of three offspring on the winning team at La Baule CSIO5* Nations Cup show. Also had two offspring on the winning team at Aachen CSIO5* Nations Cup. Sire : Contender. Dam by Landgraf. Classic Cor de le Bryere X Ladykiller breeding. Sire : Rebell II (HANN). Dam : Kuriosa by Furioso II (SF). Sire is a full brother to Ratina Z.
Sire of showjumpers, eventers and show horses. Five star stallion for eventing progeny. Sire : Master Imp. Dam by King of Diamonds. Sire of showjumpers, eventers and show horses. Sire : Cruising. Dam by Laughton's Flight. Up and coming young stallion with a good strike rate for the limited number of mares that he has covered. Both sire and dam-sire are proven as producers of international performers. Sire : Fusaichi Pegasus. Dam by AP Indy. Superbly bred TB and sire of numerous show horses and eventers. Sire : Cornet Obolensky. Dam : HHS Geneva by OBOS Quality 004 x Clover Hill x King Of Diamonds. Dam is a young mare (2011) and currently competing at CSI 1.45m. From a long lineage of Int. performers. Sire : Diarado x Oanna by Sandro Song. Diarado is by Diamont De Semilly x Corrado I X Contender. Sire : Golden Beaker (TB). Dam by Tara (RID). Very successful sire of international performers and super broodmare sire. Sire : Knock Boy. Dam by Tara (RID). Sire : Sea Crest (RID). Dam by Nordlys (TB) X Water Serpent (TB). The best ever Irish bred stallion performer. Winner of the Aachen Grand Prix along with a host of other top competitions. 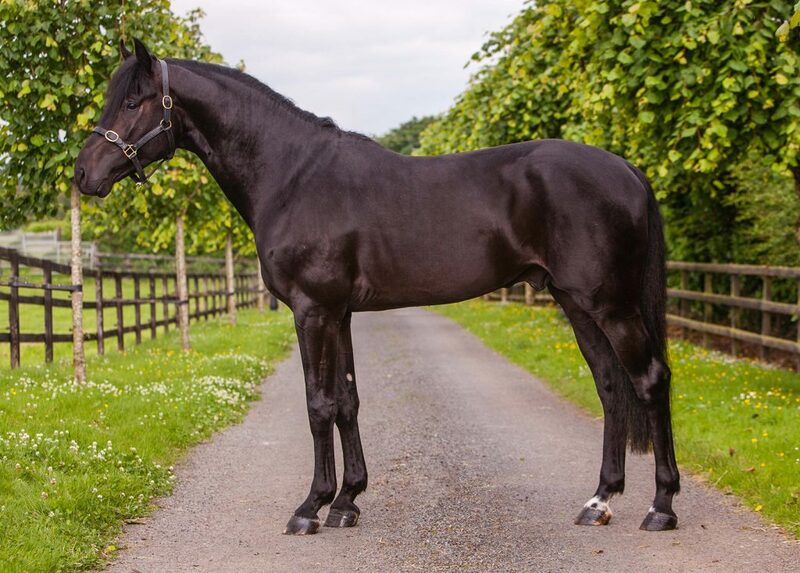 Five star stallion for performance and progeny in both showjumping and eventing. Sire of 2012 World Cup winner, Flexible (ridden by Rich Fellars, pictured below) Super broodmare sire. See 'Video' page to view Aachen Grand Prix win 1999. Sire : Cruising (ISH). Dam : My Countess (ISH). Winner British Open Showjumping Championships. Winner Welsh Masters, Winner Arena UK Grand Prix. Madrid CSI 5* 5th Grandprix, Queen Elizabeth Cup 3rd Place •Paris CSI5* 1st Place, Sunshine Tour Spain 1st place Grandprix •Doncaster 1 40mt 3rdplace, Dublin RDS 1st place 8yr olds •Kill 1st Champions of the year Grandprix, Boswell 1st Grand Prix. Sire : Diamond Lad (RID). 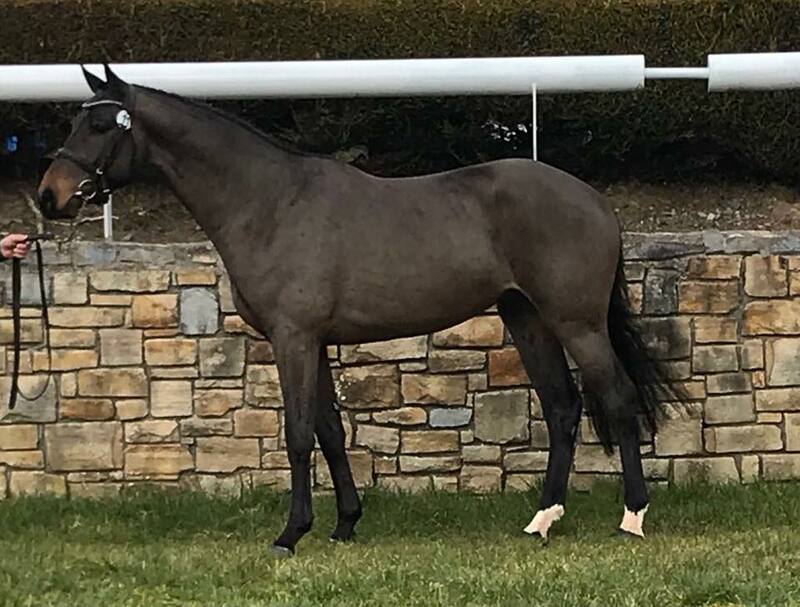 Dam by Colinstable (TB) X Final Problem (TB). Sire of many show horses and showjumpers. Sire : Green Desert Dam : Green Leaf by Alydar. Winner of two races and listed placed. Eventing sire. Sire :Primo Dominie X Kahyasi. Winner of Croker Cup for best TB stallion at RDS Dublin Horse Show. Eventing sire. Sire : Quick Star (SF). Dam : Reichsdame by Domino (Hann). International showjumper and 5* stallion for showjumping progeny. Competed on Nations Cups Teams for Ireland. Sire of Nation's Cup performers such as Lisona, ridden by Darragh Kerins and Castlefield Eclipse, ridden by Paul Estermann and they have been selected to represent Switzerland at the 2012 Olympics. Sire : Burggraff. Dam by Ramiro Z X Joost. Sire of many international showjumpers. Bred by the famous Roelofs stud in the Netherlands. Five star stallion for showjumping progeny. Awarded 'Keur' status by the KWPN IN 2011. Sire : Acobat II. Dam sire : Silvano X Hanassi (TB). Champion 4 yr old Kerrygold RDS Dublin Horse Show •Champion 4 yr old Cavan International Show •Champion 5 yr old Northern Ireland Championships Balmoral •Champion 5 yr old Cavan Classic •Zwolle International Stallion Show 3rd 7 yr old class •1st Chester International UK •7th Hickstead International in 2 classes •3rd RDS Dublin Horse Show Six Bar International Class jumping 1.98mt •1st KWPN Stallion Class Zwolle Z level •1st 1. 40mt Zelhern International Holland. Sire : Calvani by Cartino. Dam by Wendekreis. International showjumper. Champion 4YO RDS Dublin Horse Show. Sire : Flamenco De Semilly by Le Tot Semilly. Winner of Global Champions Tour Grand Prix, Valencia 2011 plus numerous other International Grand Prix. Five star stallion for showjumping performance. Sire : Capitol I . Dam by Lord X Sacramento Song. Ranked no.7 sire of showjumpers in the WBFSH sire rankings 2014. Olympic and Nation's Cup show jumper. Sire of numerous International showjumpers. Sire : Foxhunter. Dam by Metellus. Olympic and Nation's Cup show jumper. Five star stallion for show jumping performance. Sire of Grand Prix winner, HHS Fortuna. Five star stallion for showjumping performance. Sire : Rosire. Dam by Starter. Sire of International showjumpers and event horses. Sire : Clinton. Dam by Heartbreaker. Ranked no.2 sire of showjumpers in the WBFSH sire rankings 2014. Superbly bred stallion who was a permanent member of the German showjumping teams of late. Sire of numerous high class international showjumpers. Sire : Voltaire. Dam by Nimmerdor. Ranked no.1 sire of showjumpers in the WBFSH sire rankings 2014. Sire : Three time World Cup winner and Olympic Champion, Baloubet Du Rouet. Dam by Continue. Ranked no.8 sire of showjumpers in the WBFSH sire rankings 2015. However pictured below are some progeny of the aforementioned stallions. Heather Blaze by Diamond Lad X Coevers. Sire : King Of Diamonds. Dam : Kildalton Countess by Ben Purple. 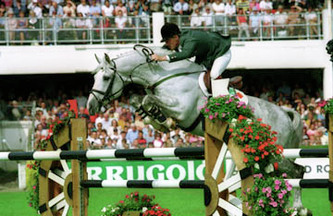 Sire of numerous international showjumpers including the above mare, Heather Blaze who had lots of international wins and competed on Nations Cups teams for Ireland. Proven broodmare and stallion sire. Click ' here ' for video of Heather Blaze jumping at Spruce Meadows 1992. Sire : Sallust. Dam by Raise A Native. Sire of many international event horses including Colour Scheme and Colour Coded, pictured above. 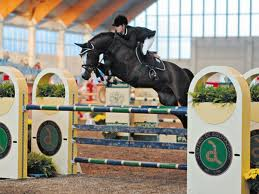 Sire of international showjumpers including Richmont Park, pictured above, Falsterbo Grand Prix winner. Just like his own sire, Master Imp is a sire of International showjumpers and event horses. Pictured above is international event winner Master Mexico. Also sire of the highly regarded stallions, Golden Master (TB) and Kings Master (ISH).